FractalMaker lets you explore and create amazing Mandelbrot fractals using a new coloring algorithm called SAM (the Stripe Average Method) as seen in the screenshot. It's really easy. Just tap anywhere in the grayscale Mandelbrot on the right and a new fractal is rendered in the previewer on the left using the current gradient and parameters. Tap the Zoom buttons to increase or decrease the zoom factor in 10x increments or choose a specific zoom factor from the popover. Tap anywhere in the Fractal Previewer to center the fractal at that point. You can also drag or pinch it to precisely position or zoom the fractal. The 4 SAM parameters give you a lot of creative flexibility. There is an excellent Gradient Creation popover to let you create your own custom gradients to fill the exterior of the fractal. Use the Color Picker to choose RGB or HSB colors by bar, slider or text entry for any colorstop in the gradient. When you're satisfied with your fractal you can render it out at a larger size and more importantly with 4x4 antialiasing for the best results. Then you can switch to Viewer Mode to see more of the fractal without the editing controls. Finally, save your Fractal by adding it to the Fractal Library so you can retrieve it later. Have fun exploring fractal space. This is the Editing View, which is what you see when the app is launched the first time. It's where you create the fractal by setting values and then render it. Note the Gradient Bar in the upper left corner of the iPad and the Switch Control immediately to its right. When you click the Gradient Bar it presents the Gradient Maker Popover. HINT: The Switch Control, when it's in the OFF position, allows you to make multiple changes to the Gradient without rendering the Fractal after each change. It's very important to switch this off if you plan to drag the Colorstops of the Gradient or make more than a minor color change, especially if the current Fractal renders very slowly. When you are finished modifying the Gradient, then switch the Gradient Bar back on, and the app will render a new fractal with your new gradient. In the GradientMaker screenshot up above, notice the ColorWell on the far right. It has a mint green color with a thick white border. This is the color of the currently selected ColorStop in the gradient. When you tap on the ColorWell, it presents the Color Popover that you see below. The Color Popover gives you fine-grained control for selecting a color. 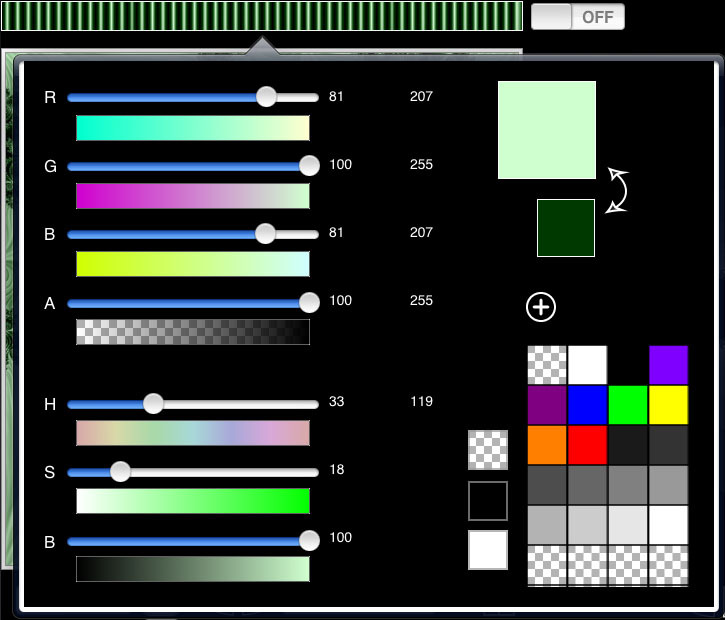 Alternatively, you can select colors directly in the GradientMaker by tapping or dragging in the rainbow or grayscale gradients at the bottom of the GradientMaker. To change the location of a particular color just drag the ColorStop. There is an even easier way to choose a gradient for your fractal. In the toolbar at the bottom of the iPad, just tap on the Gradients Button. That will bring up the Gradient Library, shown in the screenshot below, with lots of gradients already made for you. Just flick through the scrollable gradients and then tap the gradient you want. You can also store your own custom gradients in the Gradient Library. Just click the white 'Plus Symbol' in a circle button at the bottom-right of the GradientMaker Popover. Basically, there are two parts to navigating Fractal-Space: Positioning and zooming. You will use them in concert to choose a fractal. Positioning just means choosing an x,y coordinate in Fractal-Space and there are several ways to do this. When you first start exploring Fractal-Space, the easiest way to proceed is to tap somewhere in the grayscale Mandelbrot Navigator image on the right side of the iPad. This gives you a general location for your fractal, which is shown by the Targeter (the white circle) and the resulting fractal will be rendered in the Fractal Viewer on the left side of the iPad. Once you have a general location, you can tap or drag in the Fractal Viewer on the left side for more fine-grained positioning. 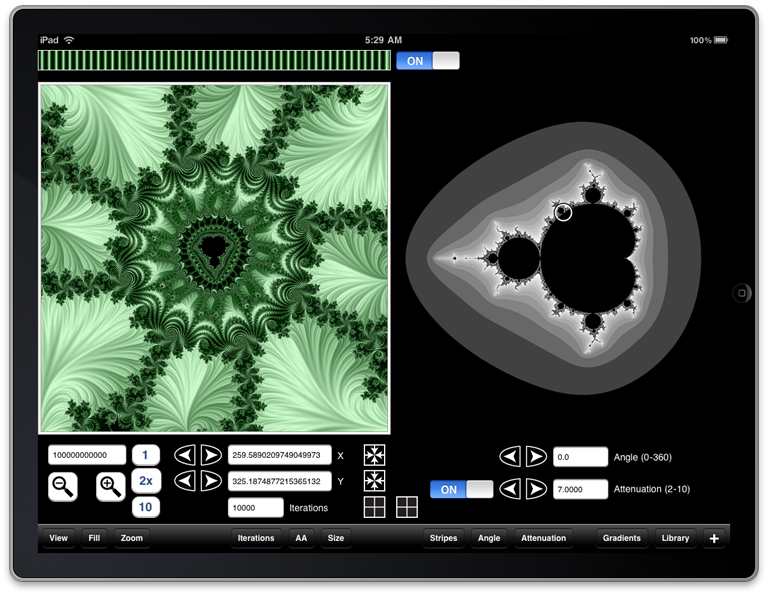 When you tap in the Fractal Viewer, the fractal is automatically recentered such that the tap point becomes the new center of the fractal. If you drag the fractal, then a new fractal is rendered such that it effectively just fills in the part of the fractal that is missing due to the drag. In the bottom-left corner of the iPad, when in Editing Mode, there are five buttons and a textfield that control zooming. (NOTE: You can also do the standard Pinch Gesture to zoom in the Fractal Viewer.) The two buttons with a magnifying glass icon and three buttons with titles of '1', '2x' and '10'. In the bottom-left of the toolbar, there is a Zoom button. Here's what happens when you tap on them. Just click a zoom value. If you aren't familiar with scientific notation, like 1e4, the 4 is the exponent to take 10 to. In other words, 1e4 means 10 to the fourth power or (10 x 10 x 10 x 10) == 10000. The easy way to remember it is that the number after the e is how many zeros there are after the 1. 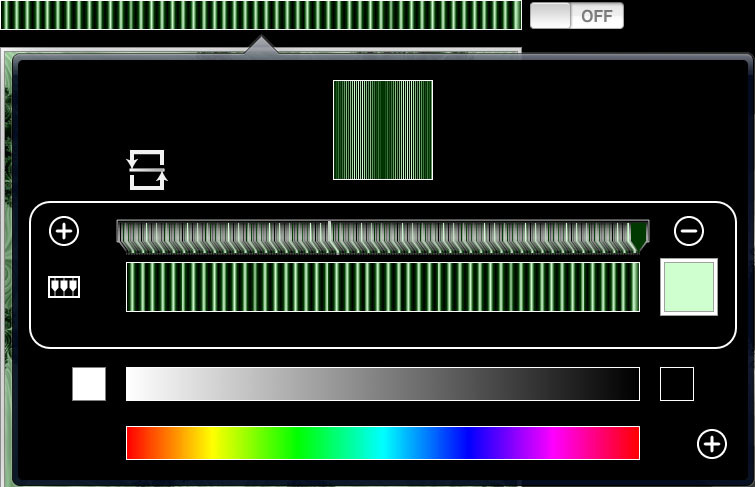 The zoom range in this app is from 1 to 1e14. If you zoom beyond 1e14 your fractal will experience Pixellation-Death. The easy was to set the Iteration Count is to use the Iterations Popver, which you can show by tapping on the Iterations Button on the left side of the Toolbar at the bottom of the iPad. Generally you want use the smallest number of iterations that will give you the accuracy level needed to properly render the fractal. For instance, the deeper that you zoom into the fractal, eg the higher the zoom factor, the more iterations you will need to prevent Blackout. There are no absolute rules correlating Zoom Factor to Iteration Count. However there are some useful guidelines. For Mandelbrot Fractals, using the SAM fill type, you generally want to use at least 2000 iterations to prevent banding up to a zoom factor of about 1e7. For the Basic fill type you can use smaller iteration counts. If you are getting a lot black in your fractals that doesn't look like it's part of the Mandelbrot interior, then try increasing the iteration count. However, if your fractal is all black, there's a good chance that you zoomed deep into the interior of a muBrot, so try decreasing the zoom factor, and then reposition the fractal. In the bottom-left of the Toolbar you will see the Fill Button. This lets you choose how to fill the exterior of the fractal. The first type of fill is called the 'Stripe Average Method' or SAM for short. The second type is really only included for speed, that is, you should use it when you are first setting up your fractal because it renders much faster than SAM. Of course the downside is, it doesn't look nearly as awesome as the SAM fill type. When the SAM fill type is chosen, additional controls are revealed on the bottom-right of the iPad. The Stripes (or Stripe Density) controls how many striation tendrils are used to fill in a particular section of the fractal. I found that in general you get the best results using from 1 to 4 Stripes. Stripes are closely tied to the optional Attenuation factor. If you are using Attenuation and your fractal starts to look too noisy, then decrease the Stripe count, or decrease the Attenuation factor. Stripes are also affected by how many colors you have in your gradient. So to decrease noise, try using a gradient with less colors, or at least spread the colors out more in the critical areas of the gradient. The Angle parameter effectively controls the rotation of the gradient within the SAM calculations. It does not rotate the fractal. Use the Attenuation Switch to toggle it on and off. Attenuation is a way to weight the coloring of the SAM method such that smaller values can provide more detail. You have to be careful to not make the value too small or your fractal might look too noisy. The general useful range is roughly 5.0 to 7.0, but various other settings can extend or truncate this range. The other factors include the tightness and number of colors in the gradient, the Stripe count, or how close to a muBrot you are. As you will notice from the values contained in the Attenuation Popver, relatively small changes will produce radically different results. Use the values in the Popover as a general starting point, and then fine-tune the value using the Arrow Nudge Buttons or the TextField. The Stripe Average Method can produce really beautiful fractals. Check out the Gallery for some examples of finished fractals using that method. Put simply: AntiAliasing is how you give your fractal smoothe clarity (get rid of the jaggies). In this app, we achieve antialiasing by supersampling, eg we render the fractal at 4 times the final width and height and then downsample it. Unfortunately this means that it takes SIXTEEN times as long to render a fractal when 4x4 Antialiasing is turned on. Therefore, when you are composing your fractal you should make sure to turn AntiAliasing off. Then when you are ready to render your final fractal, turn AntiAliasing on. To toggle AntiAliasing on and off use the AA button in the toolbar. 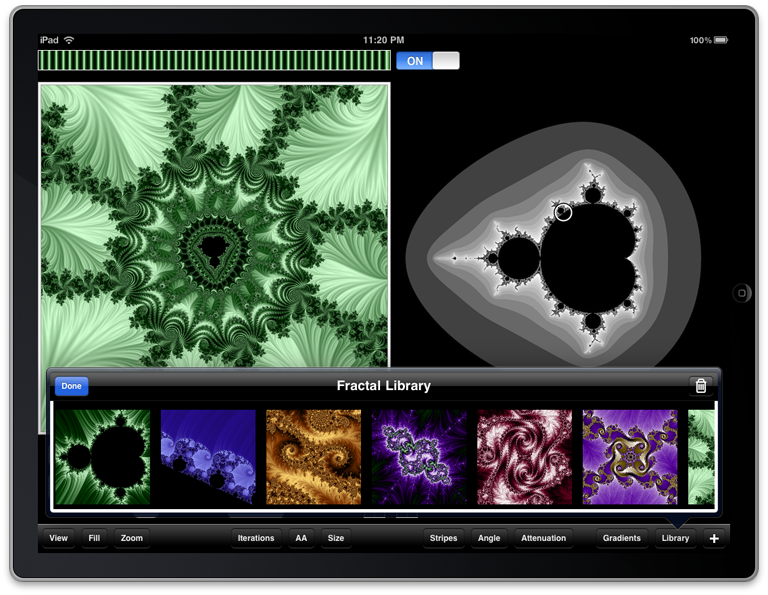 The Fractal Library is where you store fractals that you create and then of course choose any fractal from the Library to load into the app. 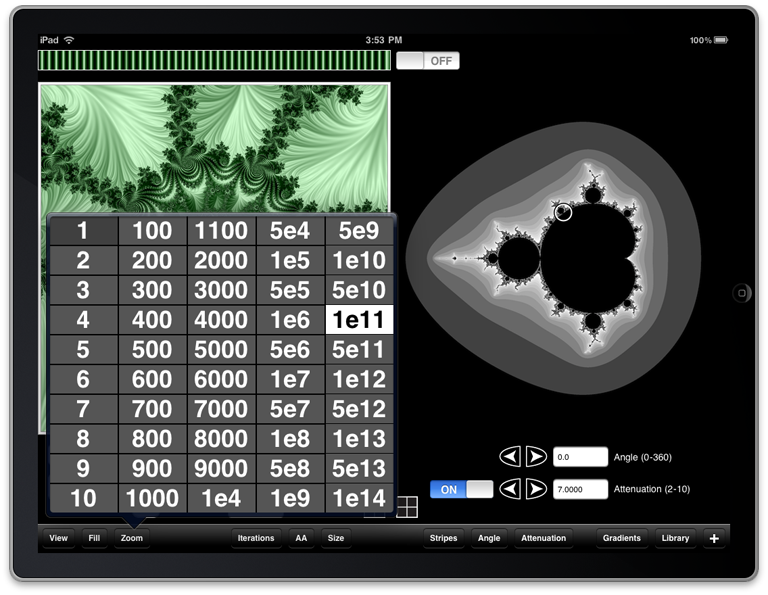 To show the Fractal Library, just tap the Library Button in the far-right of the Toolbar. 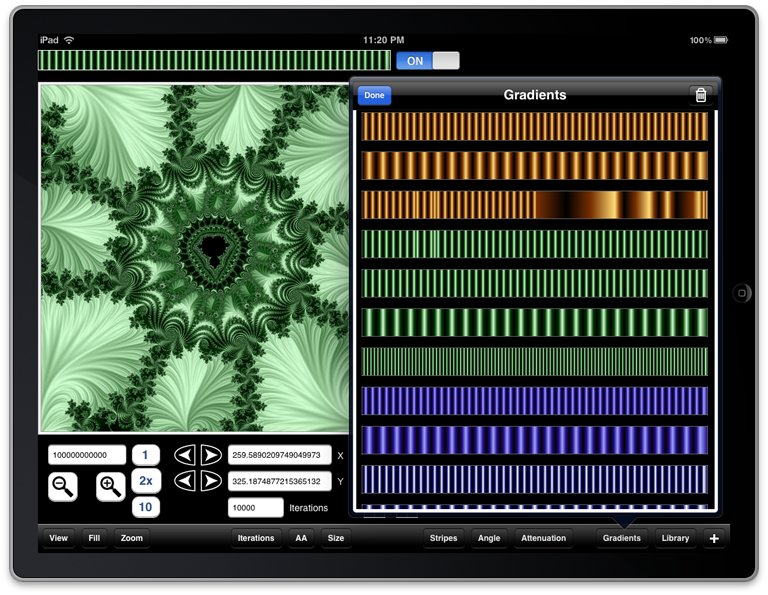 Then flick a fractal into view in the scroller and tap to select a fractal. The selected fractal will show a red border. To delete a fractal, just select it and then tap the Trash Button in the far-right of the Toolbar in the Library Popover.